The FY 2014 General Fund budget seeks to advance the academic excellence of the University of Michigan-Ann Arbor through the continued support of our outstanding educational programs and to further our commitment to student access through an unprecedented investment in financial aid. The budget proposal includes the lowest in-state undergraduate tuition rate increase in nearly 30 years, demonstrating our commitment to the families and students of the state of Michigan. The out-of-state undergraduate rate increase is higher but is still less than many of our competitor institutions. Specifically, the recommended rate increases are $148 per year (1.1%) for in-state undergraduates and $1,270 per year (3.2%) for out-of-state undergraduates. Most graduate and professional rates are increasing by just 1.8%, and a limited number of differentials are also recommended for specific programs. The budget recommendation also includes a historic investment in student financial aid. The proposed increase of 13.7% in need-based financial aid for undergraduates is the largest percentage increase in 20 years, illustrating our unwavering commitment to enabling qualified students to receive a U-M education. There will be no increase in the cost to attend U-M for the typical undergraduate student who has financial need, and for many in-state undergraduate students with need, the cost will decrease significantly, resulting in lower packaged loan amounts. In fact, today, it costs less for the typical in-state undergraduate student from a family with low to moderate income to attend U-M than it did in 2004. We are also expanding the commitment we made last year to begin to meet the full demonstrated financial need of low-income out-of-state undergraduate students. The FY 2014 General Fund budget is based on a multi-year integrated academic strategy and financial plan, which is designed to respond to the evolving context of higher education. The students we educate must be prepared to thrive in a society that is volatile, uncertain and global. Information technology is having a profound effect on all aspects of our lives. As we educate students for this ever-changing environment, the traditional capabilities and skills that we expect students to obtain remain important, but it is essential that they also develop a range of new skills for success in the 21st century. This includes the confidence to innovate and take risks, the skills to lead small groups and flat organizations, an ability to work effectively with people from diverse backgrounds and cultures, an entrepreneurial mindset, an aptitude for life-long learning, and a command of information technologies. To ensure the success of our graduates, the FY 2014 budget prioritizes activities that emphasize the development of these critical skills. Our schools and colleges must provide students with the opportunity to participate in experiential learning activities to supplement the classroom experience, and the budget recommendation gives top priority to protecting the quality of the academic experience through strategic investments in programs that enhance the student learning experience. These critical investments are possible through our continued practice of fiscal discipline and aggressive cost containment, complemented with the use of philanthropic resources. Specifically, the budget includes $24 million in reductions and reallocations for FY 2014 – a continuation of our decade-long aggressive cost containment efforts. Achieving our goals of excellence and access continues to challenge us all. State support per student has declined by nearly 50% in real dollars over the past decade, and today our state appropriation constitutes just 16% of our General Fund budget and less than 9% of our overall academic operating budget. This year’s budget recommendation assumes a 2.2% increase in the state appropriation based on the Legislature’s Conference Committee recommendation, and while we appreciate this modest increase, the overall financial situation remains challenged. To deal with our constrained financial circumstances, we have been aggressive in implementing a range of cost-cutting measures, which, over the past decade have resulted in nearly $265 million in recurring reductions and reallocation, through everything from becoming more energy-efficient, to sharing a greater portion of health care costs with employees, to standardizing our procurement practices. We are committed to continuing these efforts and also are looking to identify new sources of revenue that can help constrain tuition increases. Despite the continued fiscal challenges, the University of Michigan-Ann Arbor remains on a stable financial path largely because of this disciplined approach to financial management, which emphasizes multi-year planning, ongoing cost containment, reallocating resources toward our highest priorities and seeking new revenue. We will continue to provide an outstanding education to our students with a focus on the skills and capabilities they need to be the next generation of leaders. We also will continue to invest heavily in financial aid to ensure access to U-M to qualified students. The ability of admitted students to attend the university without regard to family financial circumstances remains a top objective of the University of Michigan. The budget recommendation includes our largest dollar investment ever in undergraduate student financial aid and the largest percentage increase in 20 years. The FY 2014 budget recommendation includes an increase of $16.4 million in centrally awarded financial aid for a total General Fund allocation of $161.2 million. The majority of this increased funding ($13.7 million) is for need-based aid that will be used to assist undergraduate students, a 13.7% increase in that budget. The rest of the proposed increase will go to graduate students. For the fifth year in a row, there will be no increase in the cost to attend U-M for the typical undergraduate student who has financial need. This year’s financial aid investment is sufficient to cover the full increase in the cost of attendance (tuition and fees, housing, textbooks and incidentals) with grant aid for these students, resulting in no increase in packaged loan amounts. In fact, this budget goes much further by reducing net cost for a large number of in-state students with financial need (reducing packaged loan amounts). The proposed financial aid budget includes an extension of our M-PACT program for in-state undergraduate students. M-PACT eliminates loans for our very neediest students and reduces loans for many low-income students and their families. This budget will reduce packaged loans by an additional $500 for Michigan students with a family income of approximately $40,000 - $120,000. Due to this program and to double-digit percentage increases in the central undergraduate financial aid budget in eight of the last nine years, today it costs less for the typical undergraduate student from Michigan from a family with low to moderate income to attend U-M than it did several years ago: the amount of loan in the financial aid package for this same student is less. We also are concerned with access for out-of-state students. The longstanding policy of the Ann Arbor campus to meet the full demonstrated financial need of all of our Michigan resident undergraduate students will continue, and we are working toward doing the same for our non-resident undergraduate students. This year’s budget provides supplemental aid to reduce unmet need for the incoming out-of-state students who need this support the most. The goal is to meet full need for incoming out-of-state students with family income up to approximately $40,000. Although this is progress, we will still fall short in our ability to provide aid to out-of-state students relative to our private peers. amount of funding for merit-based undergraduate scholarships, which, when awarded to students with need, reduce dollar-for-dollar their packaged loan amount. The average annual merit award for students with need is $6,150. The quality of our faculty is one of the most important factors contributing to the success of our academic enterprise. The University of Michigan-Ann Arbor has one of the nation’s most outstanding faculties, directly contributing to the academic excellence of the institution. Faculty recruitment and retention remains highly competitive, and over the past eight years, there have been more than 1,060 documented cases in which another university has made an offer to a University of Michigan faculty member. In 60% of those cases, the faculty member has remained at U-M. In addition, the university has successfully recruited more than 775 faculty members from other leading universities during that same period. The institutions we compete with most often for faculty include Harvard, UC-Berkeley, Stanford, University of Chicago, and University of Texas, to name a few. This budget provides the necessary resources to support a modest salary program for faculty in order to maintain our competitive position within our peer group. In addition, we remain committed to improving the student learning experience by expanding our faculty, and over the past few years, we have put in place programs to increase the faculty by 150 positions. This year’s budget proposal includes funding for a modest increase to support this effort. The FY 2014 budget prioritizes innovation in teaching and research to keep pace with the rapidly evolving needs of our students and society. By reallocating funds from lower priority activities, we will be able to invest in academic initiatives including new programs that enhance the student learning experience. A few examples are listed below. The College of Literature, Science, and the Arts has both a long tradition and a wide range of experiential and action-based learning opportunities. To increase the number and quality of these experiences, the college is developing a new Center for Engaged Academic Learning (CEAL) that will serve as a clearinghouse for students interested in engaged learning experiences, a training and support center for faculty developing programs, and a location for shared services to ensure that the rich variety of programs can be delivered as efficiently as possible. International engagement for our students remains a high priority. The School of Information is implementing an international internship grant program to provide opportunities for students to gain global perspectives through high-quality international internships. This complements their Peace Corps international master’s program, which offers students already dedicated to international service the ability to gain a targeted master’s degree in information. As another example, the Stamps School of Art and Design continues to lead in its commitment to global education and awareness, and to develop the infrastructure needed to support students in meeting the school’s international engagement requirement, including increased coordination with other campus units. We have initiated a series of digital education initiatives to experiment with different learning platforms and technologies and with different audiences all over the world. Our goal is to explore ways in which information technology can be used to complement and enhance the world-class residential education we provide, while holding down costs. We will be a leader in applying learning analytics to the student-learning data collected across all disciplines. The mission of the Michigan STEM Academies Scholars Program (M-STEM) is to strengthen and diversify the students who receive their baccalaureate degrees in science, technology, engineering, and mathematics, through customized advising, career guidance, academic learning enrichment activities, and assistance in obtaining a paid professional summer internship or research opportunity. Currently this program serves students in the College of Engineering and biology majors in the College of Literature, Science, and the Arts, but plans are to expand it to physics, chemistry and math majors over the next few years. One of the university’s most valuable resources is the University Library, which houses a nationally prominent collection that serves as a resource to the campus, the state and other universities. This year we are again investing in the library’s collections budget to ensure that the collection maintains its current value and distinction. Economic development is a key part of the University of Michigan’s public mission, and a direct result of maintaining a high quality academic enterprise. Through business engagement, technology transfer, industry partnerships, student internships, entrepreneurship and community assistance, the university is continuing to put resources toward addressing our region’s economic challenges. “Great ideas change everything” is the theme of the University of Michigan’s Entrepreneurship and Innovation website, www.innovate.U-Mich.edu, where these efforts are compiled; some highlights are included below. Recently, U-M announced the establishment of the Michigan Mobility Transformation Center (MTC), a major new partnership with government and industry to dramatically improve the safety, sustainability, and accessibility of the ways that people and goods move from place to place in our society. With the support of U-M and other universities, this region is poised to become a major industrial cluster that will define and spearhead the next generation of American advanced manufacturing. U-M is one of six universities involved in the Advanced Manufacturing Partnership (AMP), a national working group advising the White House. Commercialization of university research is creating jobs and improving the quality of life for the residents of Michigan. Here and across the globe, more U-M technologies were licensed to companies in 2012 than ever before. U-M Tech Transfer created 123 licensing agreements with industry, including 11 new start-up ventures. Researchers reported 368 new inventions in FY 2012, another record high, demonstrating the broadened participation of U-M faculty in tech transfer activities. Eleven new startup ventures, eight of which are headquartered in Michigan, were launched in FY 2012 with the guidance and resources of Tech Transfer's Venture Center. The Venture Center, a one-stop hub for entrepreneurs and investors looking for startup opportunities based on U-M research, has launched 98 new companies in the last 10 years, an average of one every five weeks. In addition, 101 U.S patents were issued in FY2012, and $13.4 million in licensing royalties was received, providing funds to reinvest in research and innovation. This spring, U-M graduated its first class of 17 students in an innovative master’s degree in entrepreneurship developed by the College of Engineering and the Ross School of Business. With more business content than a typical master of engineering and more startup content than a typical MBA, it educates students on forming and managing high-growth potential, scalable businesses. And, the Zell Entrepreneurship and Law program is preparing law students to serve both start-up and existing entrepreneurial businesses and is establishing a clinic to provide free legal advice to student entrepreneurs across campus. Alumni entrepreneurship is a key contributor to both the regional and national economies, and entrepreneurship programs are proliferating on campus. A recent study funded by the University Research Corridor found that companies founded by alumni of the three universities employed an estimated 5.5 million people, and nearly half of the companies are located in Michigan. The University of Michigan also administers and leads the fundraising for a statewide consortium of public universities to promote regional economic development and entrepreneurship, called the Michigan Initiative for Innovation and Entrepreneurship (MIIE). Another resource for economic development is the U-M’s Institute for Labor, Employment, and the Economy, which has programs aimed at assessing, understanding, and encouraging economic development. The breadth and depth of the university’s research portfolio, with record research expenditures of $1.27 billion in FY 2012, is the foundation of our economic impact in our state and beyond. It yields hundreds of ideas and thousands of graduates annually who contribute to economic development. In a move designed to fast-track more research from the lab to the real world, U-M is now a node of the National Science Foundation's (NSF) Innovation Corps program, designed to train scientists and engineers on how to extend their focus beyond basic research and toward practical applications that have value in the marketplace. The Michigan I-Corps, modeled after the NSF program but without a requirement for being an NSF researcher, launched in May across the state with seven teams that involve U-M people. The cost of doing business at a university follows a higher trajectory than it does in much of the economy, as our costs are subject to increases beyond the normal forces of inflation. This is largely because teaching and research are more labor-intensive than most activities in the economy, and it is generally the case that the costs of labor rise faster than other costs. In addition, universities make substantial investments in a broad range of new technologies and facilities to conduct leading-edge research and prepare students for careers in many fields. These are expensive investments that are central to our mission but typically do not increase revenue or create efficiencies. At the same time, the volume of activity continues to rise, further driving up costs. Our FY 2014 budget recommendation assumes a state appropriation of $279.1 million. This is a 2.2% increase over our FY 2013 budgeted amount. We understand the challenges facing the state and appreciate this increase. On a per-student basis, however, the state allocation has been cut in half over the past decade, after adjusting for inflation. We continue to operate in highly constrained financial circumstances, and respond by aggressively seeking ways to operate as efficiently as we possibly can to achieve our goals of protecting academic excellence and ensuring access to students. For more than a decade we have emphasized efficiency, and have reduced (or avoided) recurring General Fund expenditures by $265 million since FY 2004. Historically, we have achieved this by focusing on seven key areas: purchasing, energy efficiency, health benefits strategies, leveraging information technology, other revenue sources, greater productivity of staff and more efficient utilization of space and facilities. We have pursued a broad range of strategies to achieve cost reductions and long-term efficiencies in our operational areas. For instance, we have chosen to self-insure in select areas, including health benefits and risk management, so as to achieve the full financial benefit of risk-reduction programs and investment opportunities with insurance reserves. In the area of health benefits, we have further worked to align benefit offerings with the market and to ensure appropriate levels of cost sharing with employees. Additionally, we have taken an aggressive approach to controlling energy consumption through the installation of new campus systems, retrofitting existing facilities to achieve efficiencies, advanced energy purchases, and encouraging behavior changes on campus. In recent years, we have had to look deeper into the academic enterprise for efficiency opportunities. The FY 2014 budget includes $24 million in reductions and reallocation in order to meet our financial and academic goals. We will continue to make every effort to protect the excellence of the educational experience as we make reductions. We are implementing a major IT Rationalization project across the Ann Arbor campus. The intent of IT Rationalization is to provide a shared technology infrastructure, improve service, and reduce costs. The first phase of IT Rationalization has focused on improving shared foundational services including email, storage, security, server virtualization, and desktop support. We have already completed implementation of the new desktop support services for 60% of the Central Administrative units, and in the coming fiscal year, we will finish implementation for these units and expand to our schools and colleges. The university is projecting to see total annual savings of approximately $11.2 million (including approximately $4 million of cost avoidance) from the IT Rationalization effort. We currently estimate that approximately $6 million of these savings will impact the General Fund. U-M’s colleges, schools and administrative units. The current scope for Shared Services is expected to generate approximately $17 million in annual savings across the university, with a portion of these savings going to the General Fund. These savings will be achieved through three integrated action steps: managerial span of control adjustment, process standardization, and elimination of non-value added work. We also have implemented a strategic sourcing initiative, which is a systematic and fact-based approach for consolidating an organization’s spend with high-quality vendors to maximize pricing discounts. Wave 1 of this effort has reaped more than $10 million in savings to date of which approximately $3.6 million has been from the General Fund. We also recently recognized savings in the new Pharmacy Benefit Management agreement. The agreement will save the university more than $1 million per year, and the annual General Fund savings will be about $600,000. Both the academic units and administrative units are streamlining staff, largely through attrition, with several million dollars in savings expected in FY 2014. Class sizes and frequency are being adjusted across campus in order to more efficiently serve students. In addition, philanthropy plays an important role in enabling us to maintain the excellence of our academic enterprise during a period of constrained resources. The budget includes $3.8 million in newly endowed professorships, freeing up those General Fund resources for other high priority uses. The attached Table 1 summarizes the General Fund budget recommendation for FY 2014. As mentioned previously, the proposed budget reflects the assumption that the state appropriation will be $279.1 million. The budgeted increase in tuition revenue is due to changes in enrollment relative to budget, along with the effect of the proposed tuition rate increases, and a slight projected increase in the proportion of out-of-state students. Recommended rate increases are 1.1% for in-state undergraduates, 3.2% for out-of-state undergraduates and 1.8% for most graduate programs. The increase in Indirect Cost Recovery is due to growth in research. This revenue is used to offset the indirect costs associated with an increase in research volume. The overall General Fund budget is increasing by 4.5%, with academic units’ budgets increasing by just over 5%. 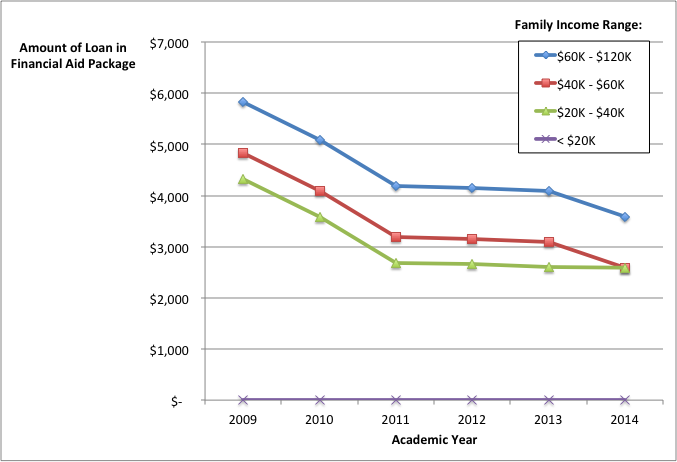 The academic units’ budget changes result from changes in number of students, tuition rate increases, the volume of research and the associated indirect cost recovery, and investments in academic initiatives; all of these new investments are funded by reallocation of funds from other activities, and thus are balanced by reductions elsewhere. As a result, the net change varies from unit to unit depending on activity. The increase to the Capital Renewal Fund is part of a long-term planned effort to establish a dedicated funding source that will address significant deferred maintenance in older buildings on campus through targeted major renovations. Most executive officer and service unit budgets are seeing modest increases. There is positive growth in the University Items category. The primary driver of this is our additional investment in centrally awarded financial aid. Over the past decade, we have relied heavily on internal reallocation and cost containment to mitigate the effect of rising costs and the simultaneous reduction in state support. The environment for recruiting and retaining faculty remains fiercely competitive, the needs of our student body continue to grow, and we must continue to ensure that qualified students of all economic backgrounds are able to attend the University of Michigan. To achieve our mission and to advance the excellence of the institution, we must maintain a focus on the future and continue to be exceptionally prudent in our planning and financial management. The FY 2014 General Fund budget proposal for the University of Michigan-Ann Arbor is based on a multi-year integrated academic strategy and financial plan focused on maintaining the academic excellence of the University of Michigan-Ann Arbor while ensuring access to students of all economic backgrounds. The budget recommendation includes our largest dollar investment ever in undergraduate financial aid along with the lowest tuition rate increase for in-state undergraduate students in nearly 30 years. In addition to investing in financial aid, $24 million in reductions and reallocations will enable the university to invest in educational innovations that strengthen our students’ learning experience. We must continually innovate, so that the topics we study, and the methods we use to create knowledge, remain at the cutting edge. The budget ensures that the university maintains its excellence, becomes even more accessible to students from all economic backgrounds, and remains a strong and vibrant contributor to the state, the region and the nation. Maintaining our position as one of the top educational and research institutions in the world is critical to our ability to ensure that our students leave the University of Michigan with the knowledge and skills they need to succeed and become the leaders and best of tomorrow.